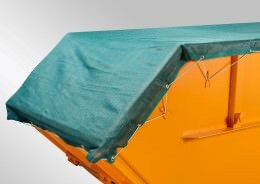 Container cover nets protect cargo from falling out of containers or skips. As covering nets, they are indispensable for safe transportation. The nets available at Safetynet365 are made-to-measure and likewise available in various standard sizes to fit commercially available containers. When transporting goods in containers, securing the cargo is a hugely important issue. For this purpose, every container needs a covering net which guarantees the protection of its cargo. This is why our container nets aren’t anything like cheap DIY store products! The nets are regularly given a very thorough test. A high standard is achieved by observing the valid European Standards regulations. The container net consists of high-strength, knotless polypropylene, which has proved its worth as a hard-wearing material. A further advantage is its flexibility: the container nets effortlessly adapt to fit cargos of different shapes. This guarantees that the container cargo is well secured. If you need to secure cargo that projects over the edge of the loading space, we recommend ordering a container-covering net with a rubber tensioning rope additionally threaded all around the edge. 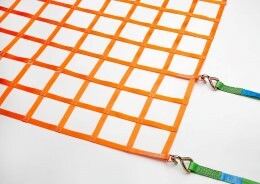 The 5-7 mm-thick border is sufficient to allow easy attachment of the net (e.g. to mounted hooks). Depending on the kind of cargo you are transporting in a container or skip, a different combination of material thickness and mesh size is recommended for your container net. 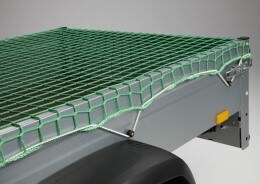 A mesh size of at most 45 mm is suggested for a cargo of small pieces, while a 100 mm mesh size combined with a thicker material suffices for transporting more bulky freight. If you’re finding it hard to select the right net, don’t hesitate to contact the Safetynet365 team – also regarding made-to-measure container nets.